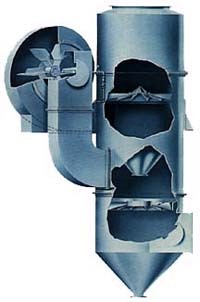 This Ducon Patented UW-4 Scrubber is a maintenance free unit, complete with integral wet fan, achieving high efficiency with medium pressure drop in applications involving heavy dust loads, and abrasive materials. Ducon Technologies, Inc., 19 Engineers Lane, Farmingdale, NY 11735. Tel: 631-694-1700; Fax: 631-420-4985.